Jennifer Stelzer from EnviroCentre is happy to be presenting this urban cycling workshop on Wednesday May 8, 2019, 7:00-8:00 pm, at the Richcraft Recreation Complex. We are grateful to our friends at TACK (Transportation Action Committee Kanata North www.tack-n.ca/) who will be joining us. This interactive workshop offers tips on route planning in your neighbourhood, best practices for becoming a confident rider and addressing the concerns and benefits of commuting by bike. • Bike boxes – what are they and how to use them. • Separated cycling facilities (one directional and bi-directional) – how they differ and safe cycling tips. • The “Copenhagen Left” – a simple two stage turning technique that reduces risks to cyclists making a left turn. • General best practices for ensuring visibility while cycling on the road. 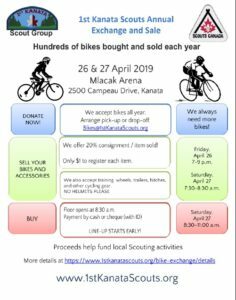 Each year 1st Kanata Scout Group hosts an Annual Bike Exchange and Sale, selling hundreds of bikes, as a service to the greater Ottawa community and to raise funds to dupport the Scouting program in Kanata. On April 26-27 buy, sell or donate a bike. The Kanata Lakes Community Association is teaming up with many organizations to launch a new program aimed at engaging high-school-aged youth and older in career discovery and soft skills development. Learn more about the program below, including opportunities to participate in career discovery sessions as well as for information for local professionals who want to make a difference by sharing their own career pathway with students. Navigating high school can be daunting. We believe that every adult professional in our community has an important role to play to mentor, teach and inspire the next generation. We believe many professionals are looking for ways in give back and contribute to building the next generation. We are looking for volunteers to devote a few hours of their week to make a difference in the lives of young people in our community. Kanata is home to a wide variety of highly-educated professionals and tradespeople who have much to share in terms of their knowledge and personal experience. Our youth want to learn more about many well-known occupations including accounting, law, project management, engineering, marketing, and medicine, as well as occupations that may be lesser known but in high demand. Inspire is your opportunity to share your knowledge and career experience with a group of young people who are embarking on some big choices for the first time. The Inspire program aims at providing a space where students can discover more about careers they may have in mind as well as learn about careers they may never before have considered. The program also offers opportunities to learn more about soft skills, which are essential to success in any career. Soft skills includes such essential skills as: effective communication, organization and time management skills, as well as interpersonal skills and relationship building. While many people think of soft-skills as innate, they are all skills that can be taught. Unfortunately, while high schools and post-secondary institutions focus on teaching academics, direct instruction on soft skills is often lacking. Indeed employers frequently lament a lack of “soft skills” among new graduates. These skills are important no matter what career path the student decides to take. While high school youth may not necessarily need to have decided on a particular career, learning more about the various career paths available can be a very enriching and motivating experience; a way of connecting what they learn in school to real life. For others who may have a particular career in mind, learning more about a potential career from an individual who is able to share their personal experiences in navigating their own path can be eye-opening. We believe many young people can benefit from this experience. The program is aimed at high-school students, young entrepreneurs and other youth (18-24 years) who are seeking information on career pathways. 2) Career Discovery Workshops – KLCA will be inviting professionals from a variety of fields to participate in a series of career discovery workshops. The workshops will allow youth to learn about a variety of career paths: traditional and non-traditional, professional and the skilled trades, as well as ask questions. Inspire will be collaborating with the recently launched Youth Entrepreneurship Program offered by the KCSBN. Check back here for details. Join Kanata Lakes Community Association Today! Sign up as a Member to help our Association work for our community.